Also serving communities of Park City, Oakley. There are 66 Assisted Living Facilities in the Sandy area, with 10 in Sandy and 56 nearby. The average cost of assisted living in Sandy is $3,230 per month. This is lower than the national median of $3,346. Cheaper nearby regions include Midvale with an average starting cost of $2,525. To help you with your search, browse the 529 reviews below for assisted living facilities in Sandy. On average, consumers rate assisted living in Sandy 4.4 out of 5 stars. Better rated regions include Midvale with an average rating of 4.5 out of 5 stars. Sandy is a city in transition, with economic growth and an evolving 1,100-acre city center transforming the locale into an ideal place for people of all ages to live, work and play. Some 96,145 people call Sandy home, and 11.4 percent of that population is aged 65 years and older. Seniors have their choice of 63 assisted living facilities (ALFs) in and around Sandy. Those facilities are licensed and regulated by the Utah Department of Health. For seniors on a budget, some aspects of living in Sandy may feel a bit pricey. Overall, the city’s cost of living is 111.6, nearly 12 points above the national average. Groceries, health care and utilities are relatively affordable, but housing and transportation rank as more costly. Sandy offers a comfortable year-round climate, with dry summers topping out at 92 degrees in July and winters that rarely dip below 21 degrees. However, the area’s high snowfall could prove difficult for seniors with mobility issues or conditions exacerbated by the cold. Thanks to a violent crime rate of just 12.4 out of 100 compared to the national average of 31.1, seniors can feel safe in Sandy – though a higher than average property crime rate is worth a second look. Public transportation in Sandy includes bus rides and the light rail, called TRAX, both offered courtesy of the Utah Transit Authority (UTA). Riders 65 years of age and older are eligible for reduced fares. The Sandy area is home to world-class medical facilities, including HealthSouth Rehabilitation Hospital of Utah and Alta View Hospital Emergency Department, in the event of medical emergencies or illness. Sandy has an array of community resources for seniors, including Salt Lake County Aging Adult Services, which helps seniors with everything from legal referrals to Medicare counseling, as well as at least one senior center. Assisted Living costs in Sandy start around $3,230 per month on average, while the nationwide average cost of assisted living is $4,000 per month, according to the latest figures from Genworth’s Cost of Care Survey. It’s important to note that assisted living rates in Sandy and the surrounding suburbs can vary widely based on factors such as location, the level of care needed, apartment size and the types of amenities offered at each community. Sandy’s low-income seniors can take advantage of two Medicaid waiver programs to help pay for assisted living. 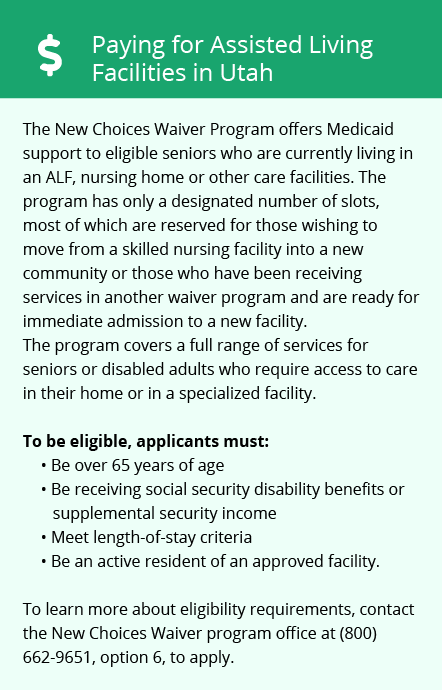 The New Choices Waiver was created to transition seniors from more institutionalized care, such as nursing homes, to free accommodations either at home or in an assisted living facility. 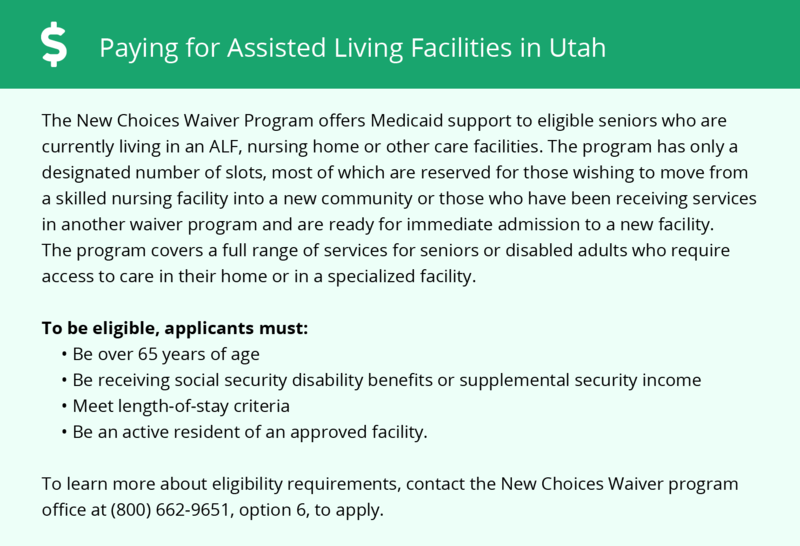 The Utah Home and Community Based Services (HCBS) Waiver includes provisions to allow those over 65 years of age to access essential services at home or while in community-based care. To see a list of free assisted living resources in Sandy, please visit our Assisted Living in Utah page. Sandy-area assisted living communities must adhere to the comprehensive set of state laws and regulations that all assisted living communities in Utah are required to follow. Visit our Assisted Living in Utah page for more information about these laws.